From the early 1980's to the late 1990's I spent a good deal of time in the dark. That was par for the course as a photographer in the good ol' Tri-X, Plus-X, D-76 days. Of course I am referring to the work I did as a Black & White Custom Photo-lab Wizard. There were so many assignments and circumstances - as I recall, from my B&L Photo years - that put me in proximity to greatness that to go down that road would be a bit more involved than I intend for this reflection. Besides, it is not all that unusual for a Professional Photographer to to be called upon to photograph events attended by important/famous people. So too, the portrait studio portion of the business certainly saw it's share of celebrity types, but a conscious disregard for the social status of the client while concentrating on the craft was always the order of the day. For me the true brushes with greatness were to occur in the lab. You see, one of our bigger clients - and certainly one of my favorites - was Curtis Licensing - later known as Curtis Management Group - currently known as CMG Worldwide. Curtis Licensing oversaw the licensing of the images and likenesses of many deceased celebrities for the estates of these individuals. I had the distinction (and high honor) of running the darkroom that was tasked with reproducing the photographs of many really big name celebrities such as Babe Ruth, Bettie Page, Humphrey Bogart, Marilyn Monroe, Amelia Earhart, Frank Lloyd Wright, Hedy Lamarr, Jim Thorpe, Joe Louis, Mark Twain, Malcom X, James Dean and many other great American icons. 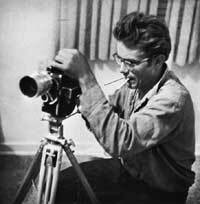 The James Dean collection of images was always popular. I enjoyed working with them because the quality of the source images were so good and "generationally speaking" they were much closer to the originals than most of the other collections. In other words; I would work from copies of the originals as opposed to copies of copies or even copies of copies of copies of the originals. I revered those rare opportunities to work from an original negative or first generation print as these were artifacts that likely found themselves in proximity to the iconic subject matter and/or in the hands of the privileged photographer who certainly met and recorded the star. Without a doubt, the most incredible artifact to come into my possession for purposes of reproduction was a tiny reel of 16mm double-perf black and white movie film. The film had been flagged (small tape tabs attached, marking particular frames of the film) and it was requested that I contact print the sequence of frames specified by the markers. 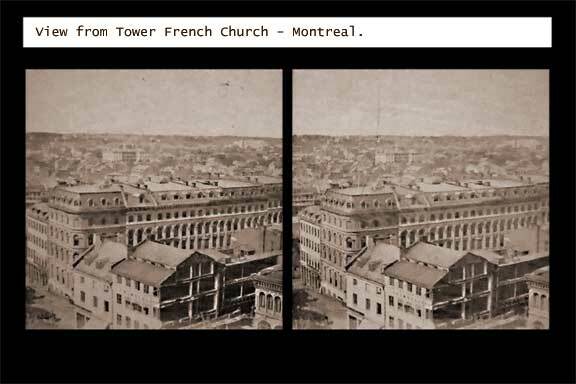 (Simply: Contact printing is a darkroom technique whereby the film is brought into direct contact with photographic paper underneath a sheet of glass. By shining the right amount of light through the film, its' image is transferred to the paper.) 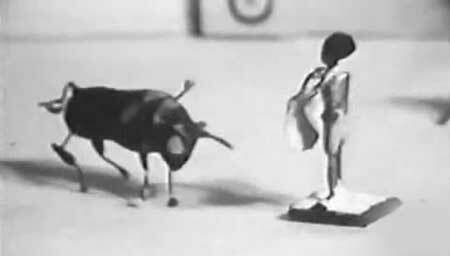 Upon examination of the film, in preparation for the procedure, I discovered that this was a stop-motion animation project featuring a bullfight in miniature. This was an original creation by James Dean himself. I was awestruck. It is very likely that this film was in Jimmy's hands. This very film-stock was mere inches from his cheek as he peered through the viewfinder of his Bolex camera and judiciously framed the shot. Each individual frame exposed - frame by carefully crafted frame by the legend himself. Oh... So... Very... Cool... In my mind it was very nearly a talisman. We have all heard of movie magic? This was the embodiment of that characterization. As I thought about it, I was taken with the notion that this was a creative, solo effort by James Dean. From the building of the models and lighting the set; painstakingly calculating the actors movements; deciding when to trip the trigger to capture the frame and moving thoughtfully onward to repeat the process literally several hundred times. This WAS James Dean - start to finish. This was certainly - for me - a brush with greatness. Stop animation is quite interesting in itself, let alone when I consider who the creative drive behind the short was. Ironically, I still have a 16mm projector too and would love to find some 16mm films to play. There's something pleasing about film. Perhaps it's nostalgia, but 16mm or any other type of ilm has a warm, natural feeling to it that DV doesn't capture. I have often thought about doing stop motion digitally but have never taken the time. I too am in possession of a 16mm Projector - only last week I was researching resources for getting movies and found what is available is relatively cheep compared to what they went for in their hay-day but still, the purchasing of movies would be a luxury I could never imagine being able to justify. Used to be... I could go to the public library and borrow quite a variety of them but those days are long gone. I am glad you checked out this post - thanks for the comments! Ebay seems to be the largest source I've found for 16mm movies. Sadly, as you pointed out, the costs are still too prohibitive for casual viewers like us. One example of a movie I saw go through on ebay was Saturn 3, a science fiction film from 1980. While it's not exactly a masterpiece, it would have been fun to have around for a summer Friday evening showing on the back deck. It went for around 500+ dollars if I recall which is completely outside of my budget. Sort of unfortunate because having a projector and no film is a waste. Still, one never knows so I'll keep my eye watchful on ebay now and then. Thinking about it in more detail, the two films I truly would like on 16mm are somewhat related at least in topic: "Planet of the Vampires" and "Alien". While the director of Alien said Planet of the Vampires had no influence on the making of Alien, there are a few similarities between the two films that are uncanny at times considering the time span between when they were both filmed. For me, both films were influential in key ways. I recall seeing Planet of the Vampires on the typical Saturday afternoon monster-movie sequences they ran in those days. Talk about cool.